So we settled on a 4D3N tour to Sumatera Indonesia to cover Lake Toba, Parapat, Berastagi and Medan. It's just a 55 minutes flight west off KL via Malaysia Airlines. It's not a very long journey but it sure a long one if you are travelling with an active toddler. Mommy alert here! See my previous post. We score a great package during the Matta Fair and everything were arranged by the tour agency. We met our tour guide and supir at Kuala Namu Airport, Pak Edi Rangkuti & Pak Ramli (which both are Muslims) and proceed our four hours journey to Lake Toba. As we made our way to Niagara Parapat Hotel, we were greeted by the magnificent view of the lake. I've been told that the Lake Toba is the largest volcanic lake in the world. The weather here is a bit chilly as we are 900m above the sea level. I barely can see fog everywhere around the hotel. It feels like we are in New Zealand! Our stay at Niagara Hotel, Parapat. The next day we took a boat (more like a ferry!) to Samosir Island. It was a cool boat ride and Lake Toba looks at its best when the water is calm. The journey took us about 45 minutes. 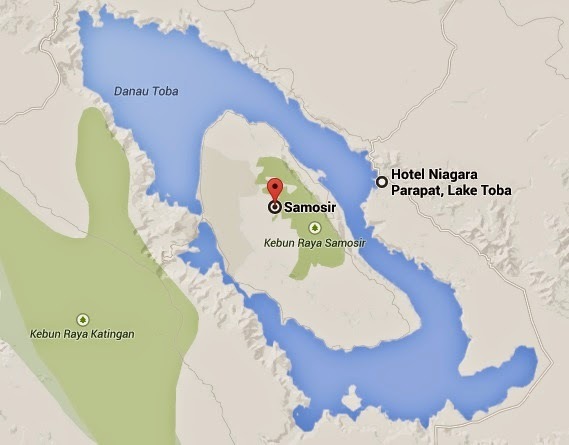 Samosir Island is actually larger than Singapore and there are mainly Batak people living in this island. Pak Edy brought us to an ancient tomb of the Batak King. Batak was known in the ancient time of eating human and they have no religion. Only then when Indonesia has implement their '5 Pancasila' which one of it are belief in the one and only God, the Batak ethnic is then being converted to a 'Malim' believers. Majority of Batak people nowadays are Christians and some of them are Muslim. The best thing about Pak Edy is that, he explained every single details of the Batak ethnicity to us from A to Z. We (my husband and I) being the boring kinda people, loves history so much. 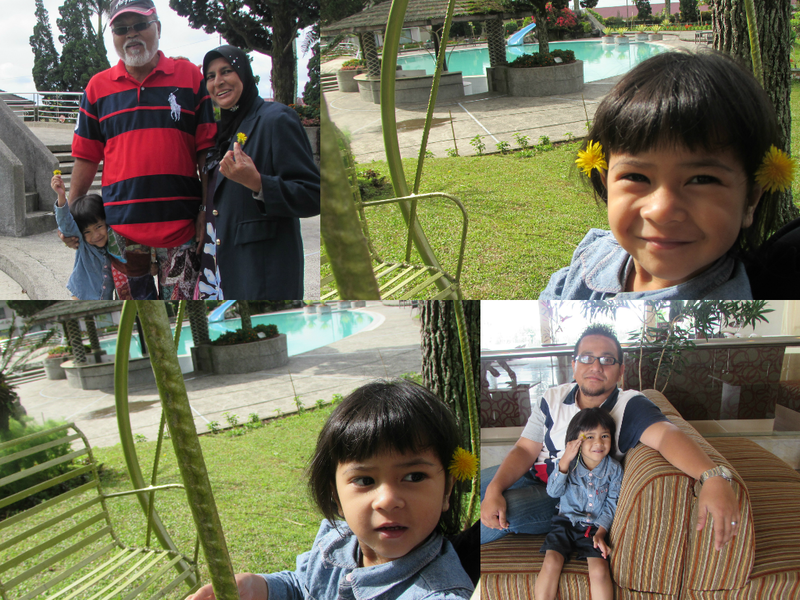 So we pay attention to every details of the story and enjoy our visit to Samosir. Some of you may be wondering about the roof design behind us and mistakenly assumed its a Minang-like design. But actually its not. Batak people houses are design based on so many aspects and one of them is the appreciation of buffalo! They believed that buffalo has a great characteristic and contributions to their society such as strong and it also ease their ancestors job by plowing the field. That is why sometimes we can see buffalo head are located on top of their houses roof. We then headed back to the mainland to get our lunch at Rumah Makan Islam Murni Parapat before continue our journey to Sipisopiso.. I can't remember how long it took us to reach Sipisopiso but it was for sure an interesting view along the road. Lake Toba was also in view for a very long stretch of the road, confirming its enormity. We broke our journey to have 'Bandrek' tea at Simarjarunjung. This place is much chilly than our Cameron Highland. You can see how much we love the weather here! We were finally at Sipisopiso. This is a viewpoint of Sipisopiso Waterfall and the last viewpoint of Lake Toba. It was so breathtaking, Masya Allah! My beloved parents posed like a newly wed huh! 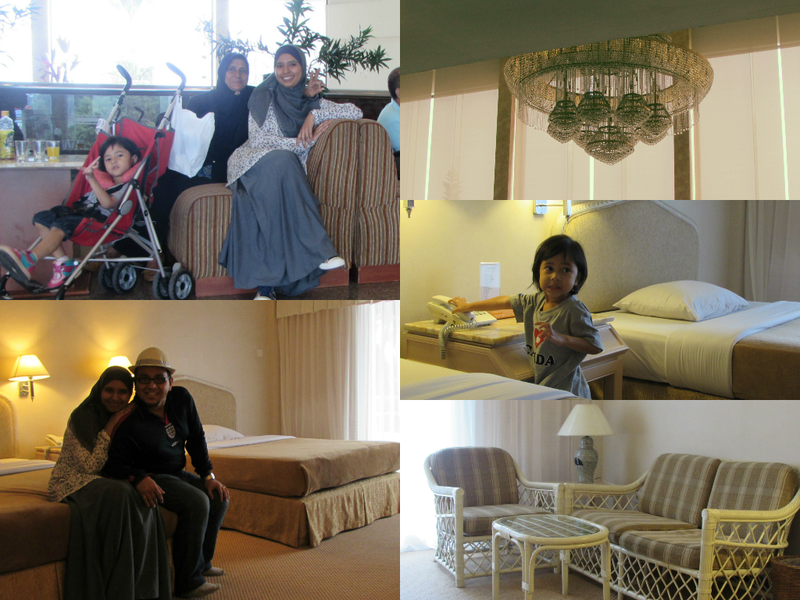 Our stay that night was at Grand Mutiara Hotel in Berastagi. This is the best hotel amongst the three hotel we stayed in Medan I can say. 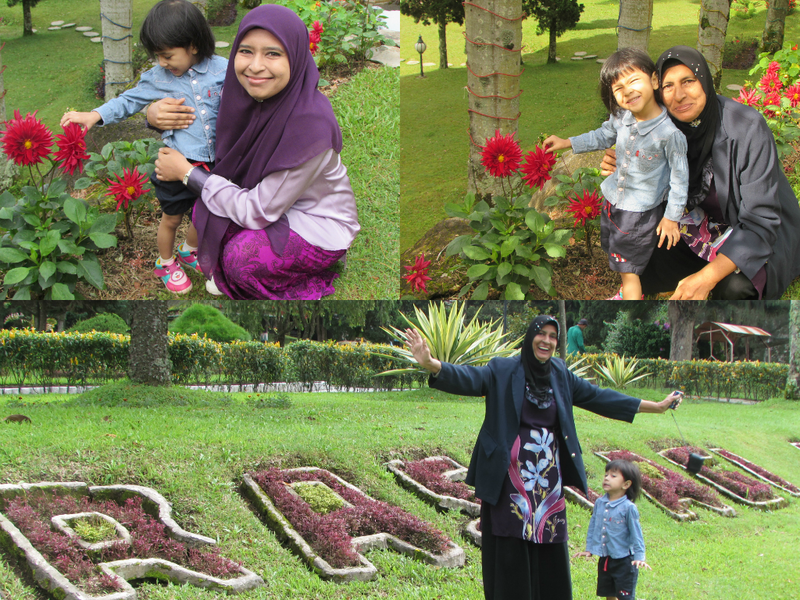 The accommodation was the best and my mom loved the garden very much. Our Day-3 trip continues to Berastagi fruit and vegetables market. Locally grown passion fruit, known as Marquisa, is one of the famous fruit we can get here sell by Karo people in this market. You get to see loads of type of plant too. I really wish to bring back home one. Unfortunately, it would be tedious to bring such things in. So we only bought the plant seeds so that we can plant them when we are home. Guess what?? we get to ride on horse too! 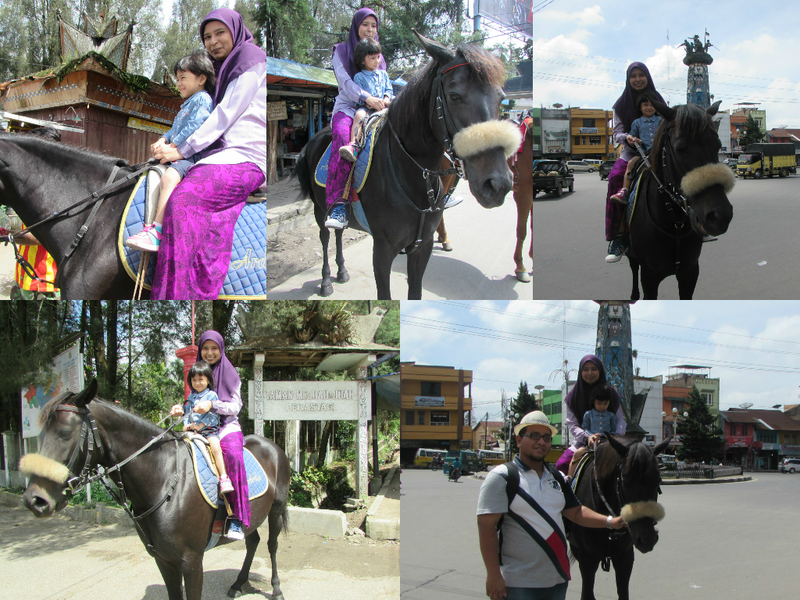 Aulia' was so giddy to ride alone on the horse but my parents insisted that I accompanied her on the horse. I was so scared when I first ride on the horse, just after a while, I was in love with it and enjoyed the joy of horse riding. We paid IDR20K for the ride around the market. 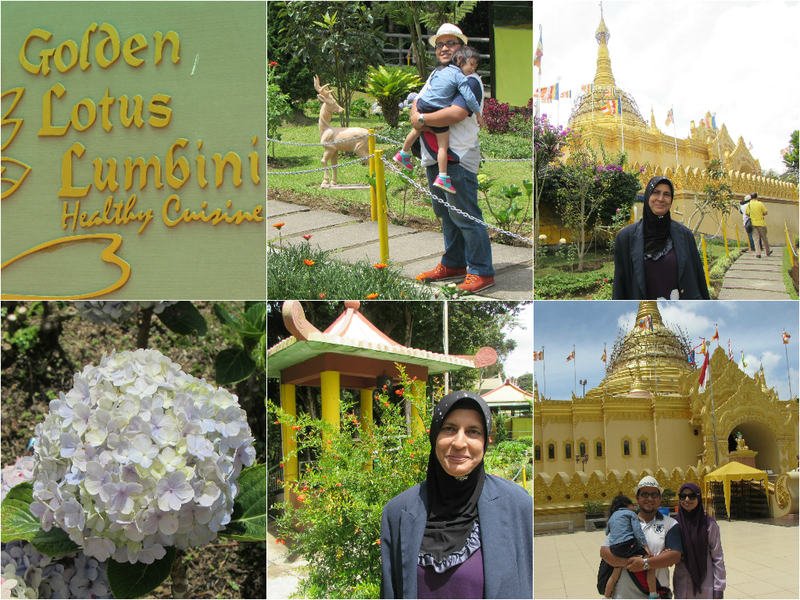 After the horse riding, we moved on our journey to Taman Alam Lumbini in Berastagi. It is free of entrance fee so far. There is a Myanmar temple or we called it Pagoda at the center of the park. We were told that it was built by a Medan tycoon whom had made a wish at Shwedagon Pagoda in Myanmar, if his wish was granted by the God, he would build a pagoda in Indonesia. So his deepest wish must have been granted that's why we had the chance to visit a Pagoda in Indonesia. We just walk around the park but somewhat we didn't enter into the temple where people pray inside. We then made a pit-stop for lunch at Sunrise Seafood restaurant before head for Zohor prayers at Masjid Raya Al-Mashun. The Grand Mosque Al-Mashun is one of the Sultan Deli's remaining historical building and it is still used by the Muslim in Medan for daily prayers. The mosque is only 200 meter from the Maimoen Palace which was built in 1906 by Sultan Ma'moen Al-Rasyid Perkasa Alamsyah and it was first used on September 19, 1909. We also visited the royal tombs which mostly the Tengku's descendant from all over the Sumatera. It is located just behind the mosque. We continue our journey that evening to the Maimoen Palace. According to our tourist guide Pak Edy, during the Green Princess time (which known as Puteri Hijau), she has her own underground tunnel from the Palace to the Grand Mosque Al-Mashun. So whenever she hear the Azan, she will cross the underground tunnel to perform her prayers at the mosque. People knew her as Puteri Hijau because she always shining in green. Whenever she went outside of the Palace, the green light can be seen from afar and it is told that she is the most beautiful princess in the Kingdom of the Great East. Auww she's definitely the hot girl being chase by the boys right! My dad told us that he knew the history of Puteri Hijau (It was from his history text book 50 years ago?). Puteri Hijau was once asked by King of Aceh to marry him but the proposal was refuse by her two brothers. The King was furious because over the refusal then attacked the Kingdom of Great East. Puteri Hijau was sent away by her brothers in a glass coffin to the sea. So no one knows what happen after that. The palace has three main rooms: the master building, the right wing and the left wing. The master building is known as the Balairung where the throne is. 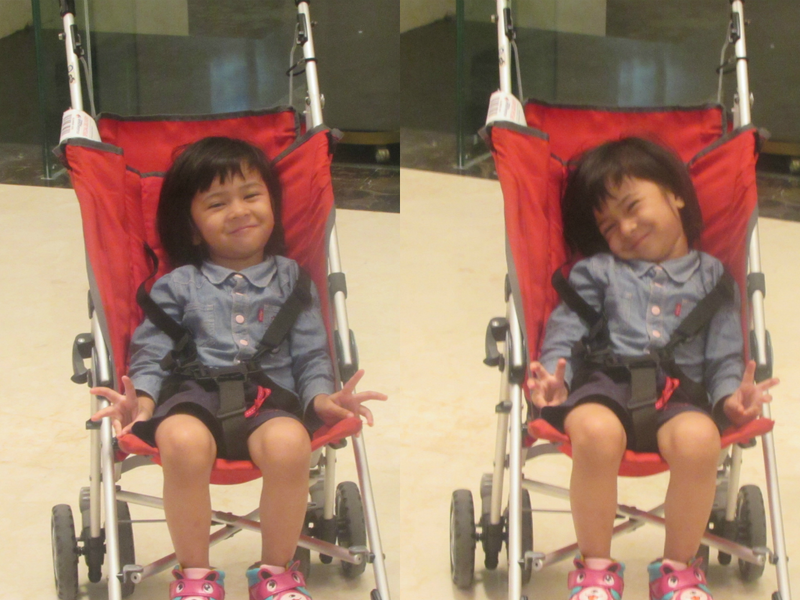 My little girl has been so tired with the tour and we decided to check into the hotel straight away that evening. We stayed at Serela Grand Hotel and this is our last stay for this Medan trip. The rooms are comfortable and they also provide free wifi inside each room unlike the other hotels we stayed in for the last two nights. The next morning we had breakfast at the hotel and check out at 10.00 a.m. We went to the nearby shopping mall to get some souvenirs to bring back home. I guess this is the end of our trip to Medan Sumatera, and Alhamdulillah we have savely arrived in Kuala Lumpur International Airport within 1 hour including at the luggage claim.